This year we started to relabel many trees and shrubs. We did about 150 altogether. The first group we did when Wilma was still around. We did 69 then. And the last bit I’m finishing by now. An example. 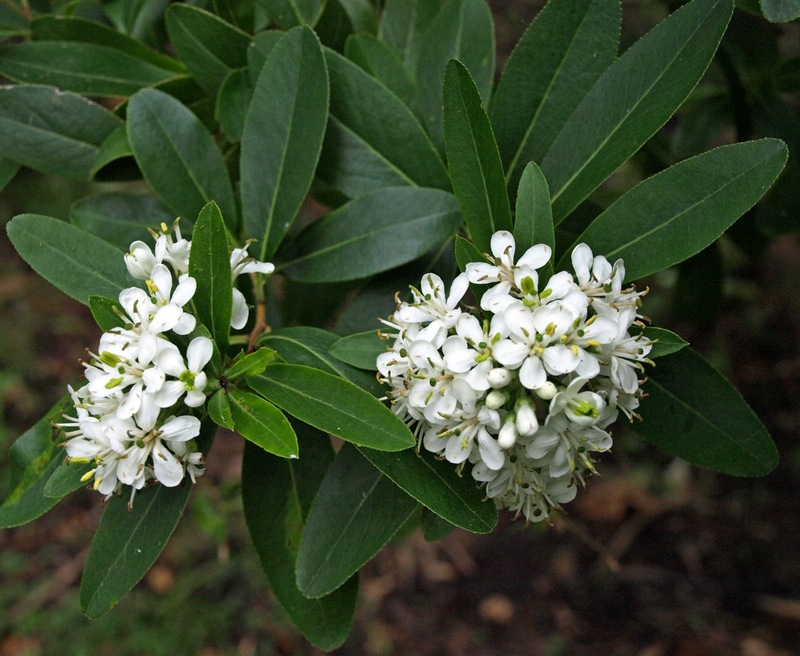 In the Oak paddock is a nice little Escallonia bifida, the White Escallonia or Chilean gumbox from South-America. Cat. 1997 049. – the catalogue number (first four digits of the catalogue number being the year of acquisition). On the back are two old labels. They tend to become unreadable. 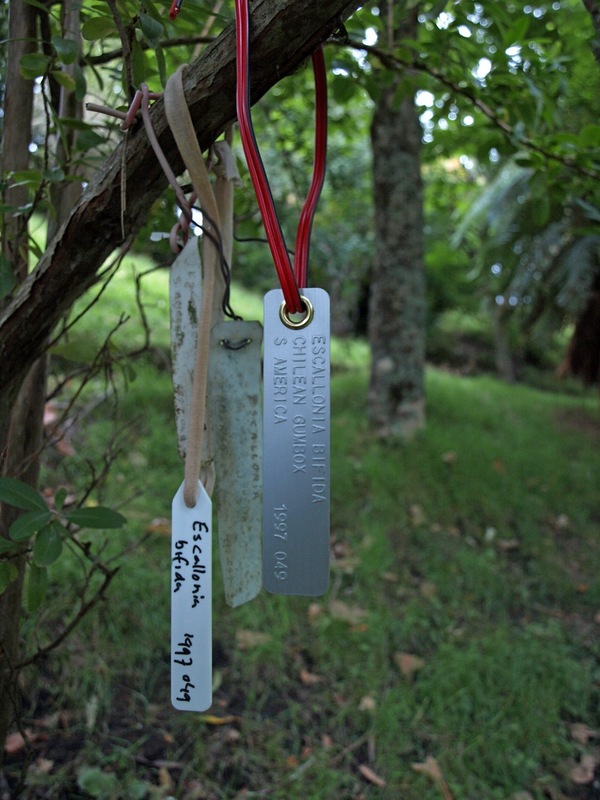 On the left is one of the temporary labels that we have been putting on all the trees that we listed for relabelling. Of course we remove all old and temporary labels if we put on the new one. The first list we did send in November. And the second list of 84 I send in some two weeks ago. We did get the labels back within a week. Next we could put the new labels on the trees. It’s quite a lot of work, but we learned to know the collection better, and more importantly: labelling is in our opinion one of the cornerstones of maintaining the collection. But enough about these “technical” things. 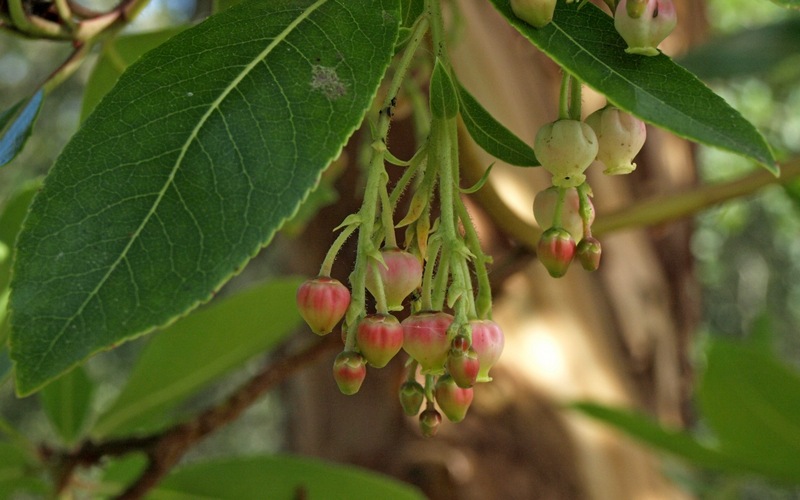 Let’s look at the Escallonia! From a distance it does not look very attractive (at least, not on my picture). Can you discover the new label (click on the image to enlarge)? The (English) name used by Uncle Bob in the catalogue (‘Chilean gumbox’) is not the most common one, I believe. 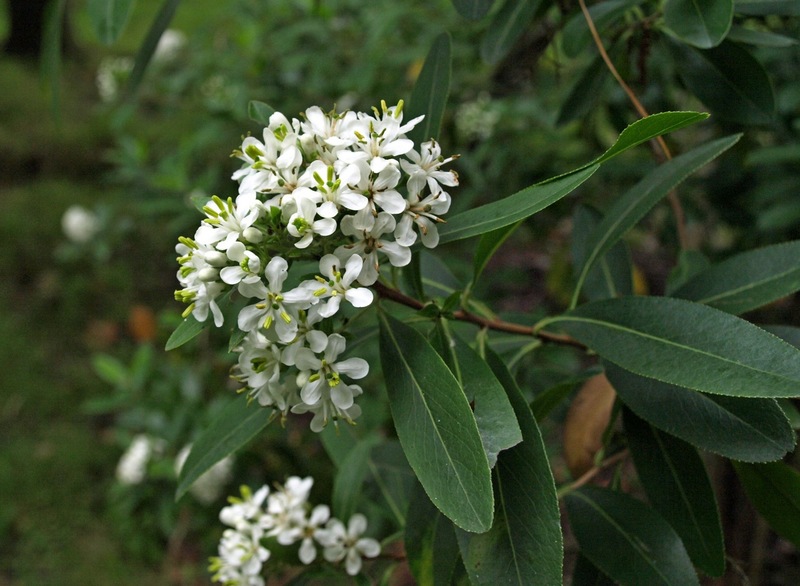 Many internet sources use the name ‘White Escallonia’. I also found ‘Cloven gumbox’. Another flowering tree in the oak paddock today. 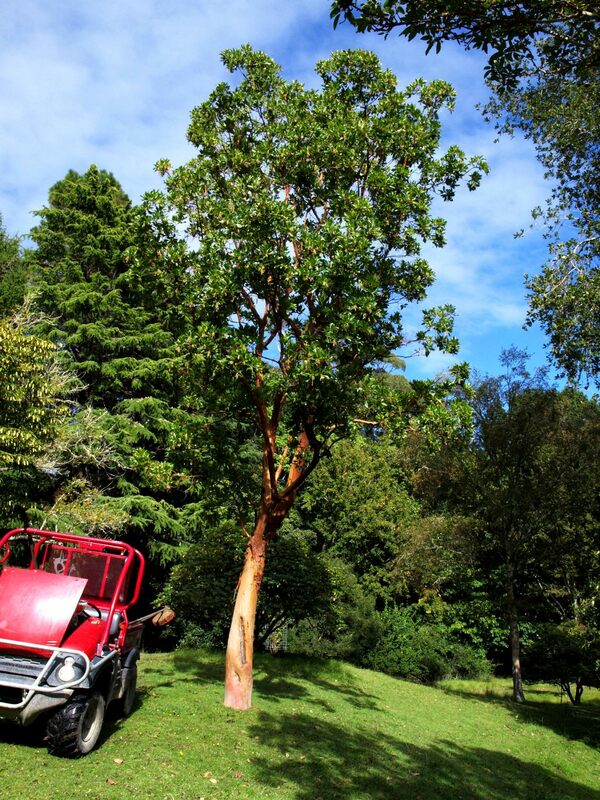 The Arbutus x andrachnoides. 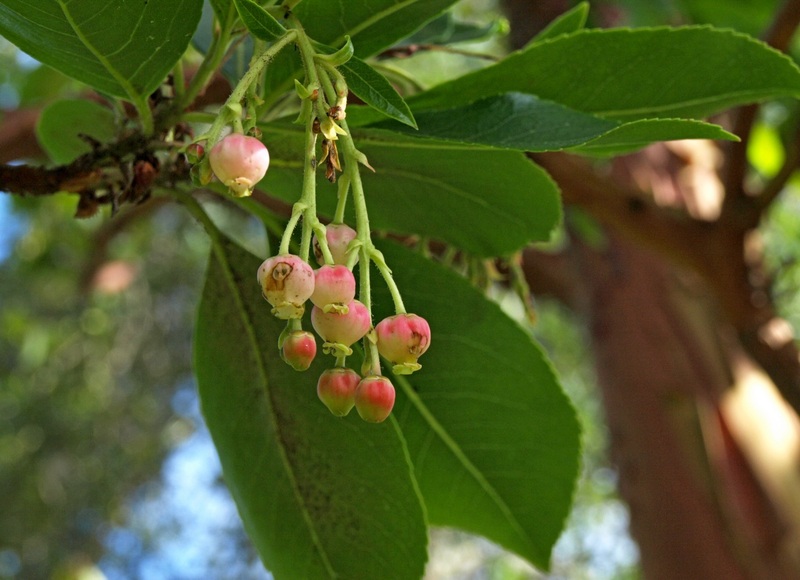 The strawberry tree (family Ericaceae). I didn’t find any strawberries, but there are interesting flowers in it. This tree has catalogue number 1995 022. That means it’s only 17 years old! The catalogue says it’s a cross of A. andrachne and A. unedo. 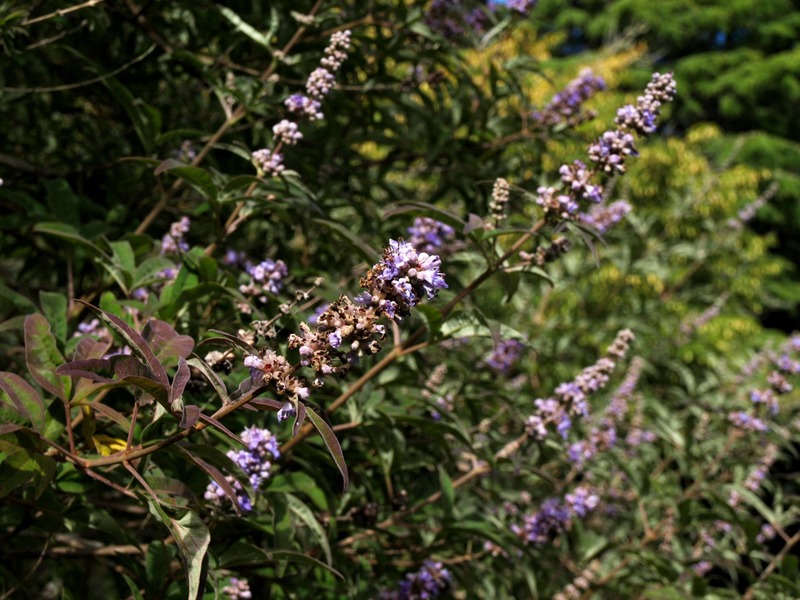 It comes from a nursery in Taranaki. There’s another one in the arboretum, closer to the homestead. I’ll see if I can find it. 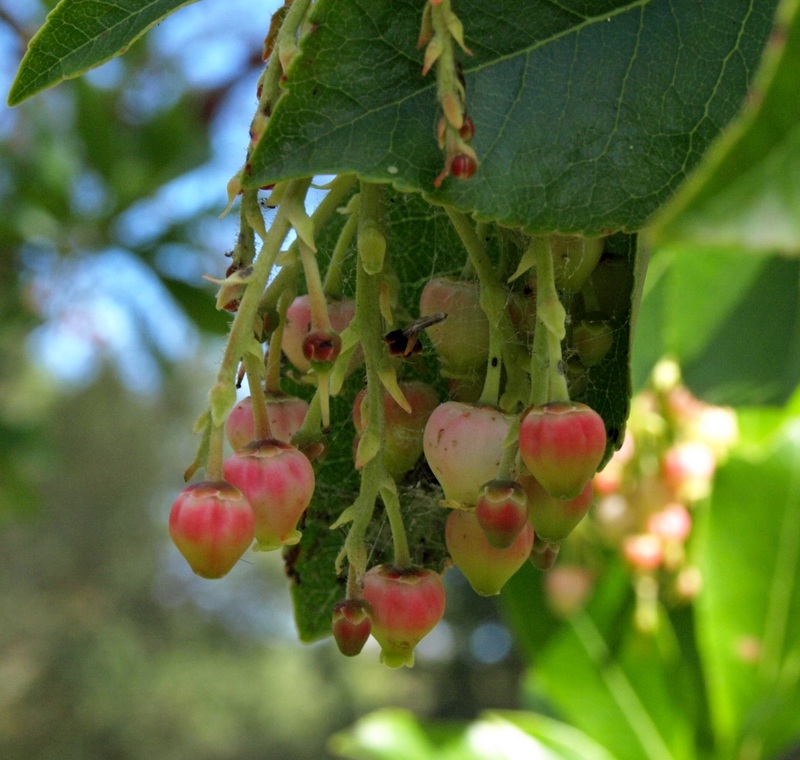 On the internet I find that this is a natural hybrid of Arbutus unedo, the (common) strawberry tree, and Arbutus andrachne, the Greek strawberry tree, that is found in Greece and Cyprus. I understand that the most interesting thing of this hybrid is the bark. 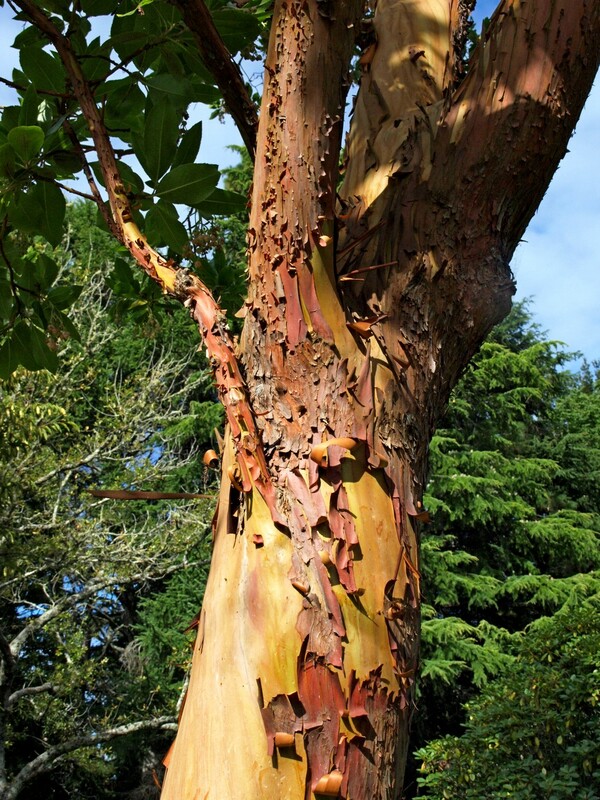 And it has quite an amazing bark! But I made pictures because it was flowering. The flowers hang down in racemes. 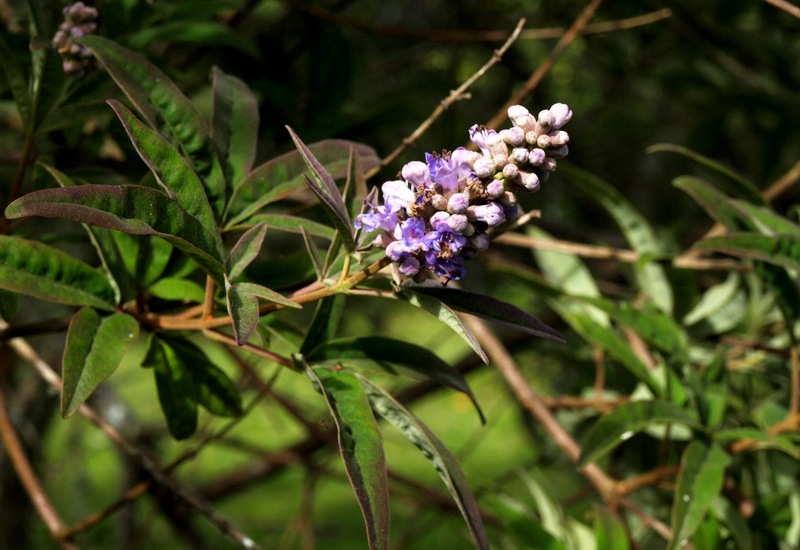 Ever heard of Vitex agnus-castus, the chaste tree? It’s from southern Europe. Yeah. 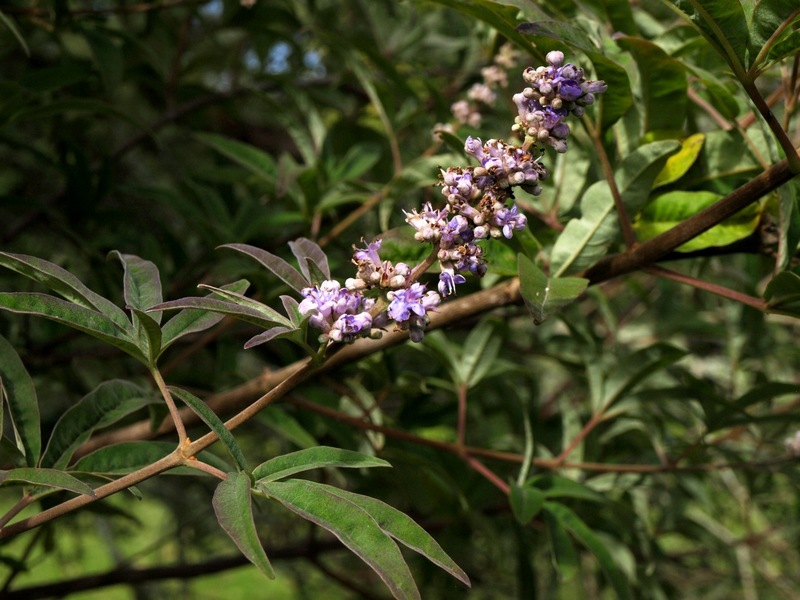 Wikipedia gives the answers, again (although there is nothing like a botanical description of the species in the lemma, and the section “garden description” is still empty): already Pliny the Elder named it! 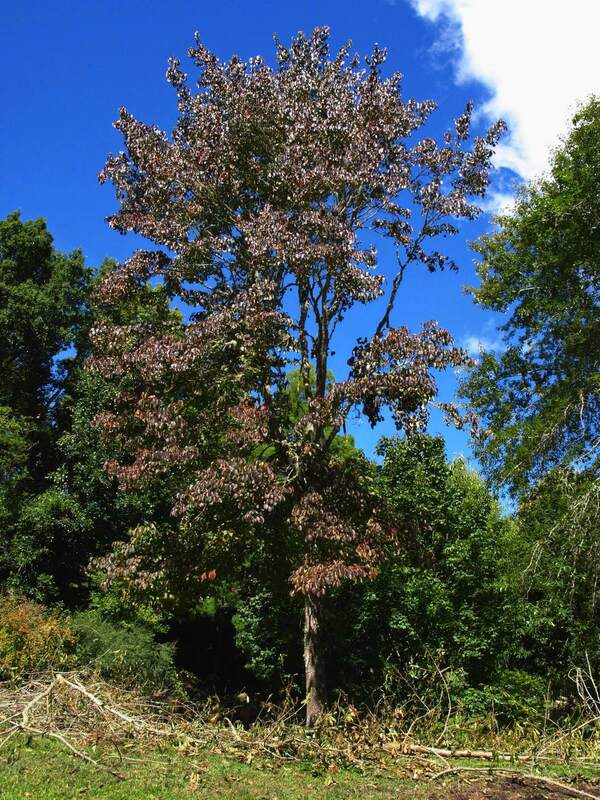 There is one in the oak paddock of our arboretum! It’s growing quite wild in all directions. Does it need any pruning? 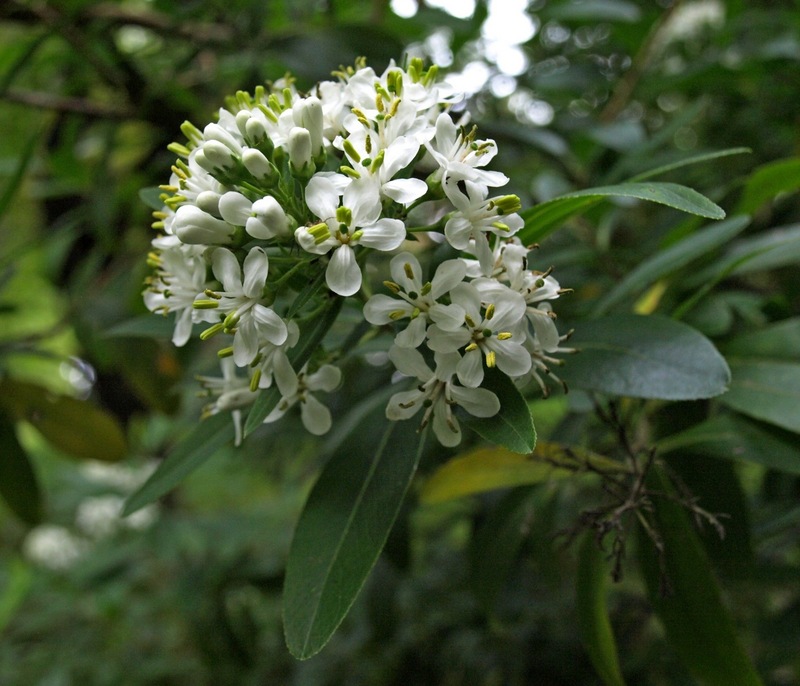 It’s one of the few trees that are flowering now. 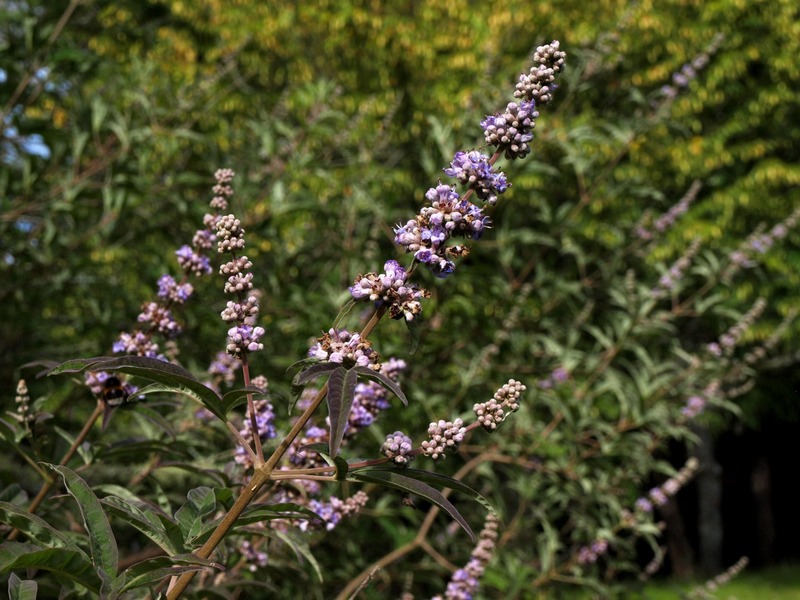 The flowers remind us a little bit of Buddleja. 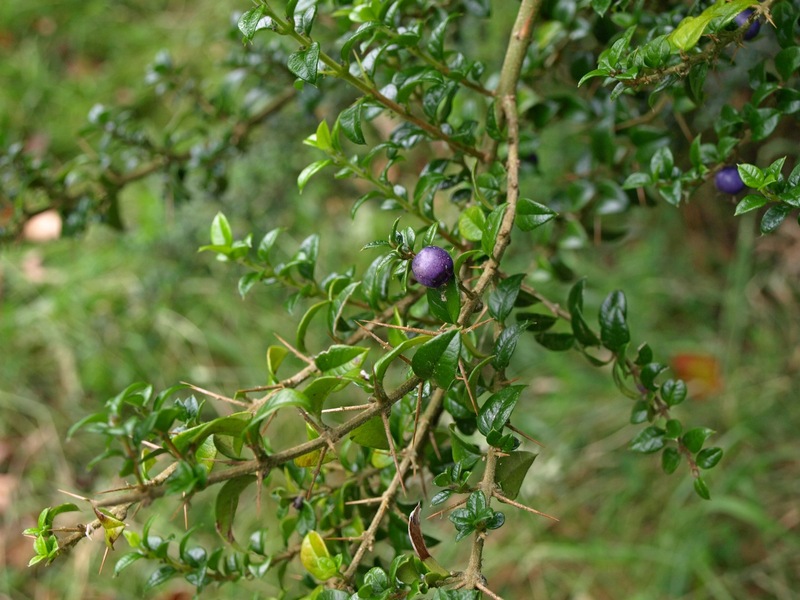 The shrub has very old associations with chastity. In ancient Greece and Rome women used the flowers for adornment, and as a symbol of chastity. In the Middle Ages monks chewed the berries to make it easier to maintain their celibacy. Well. 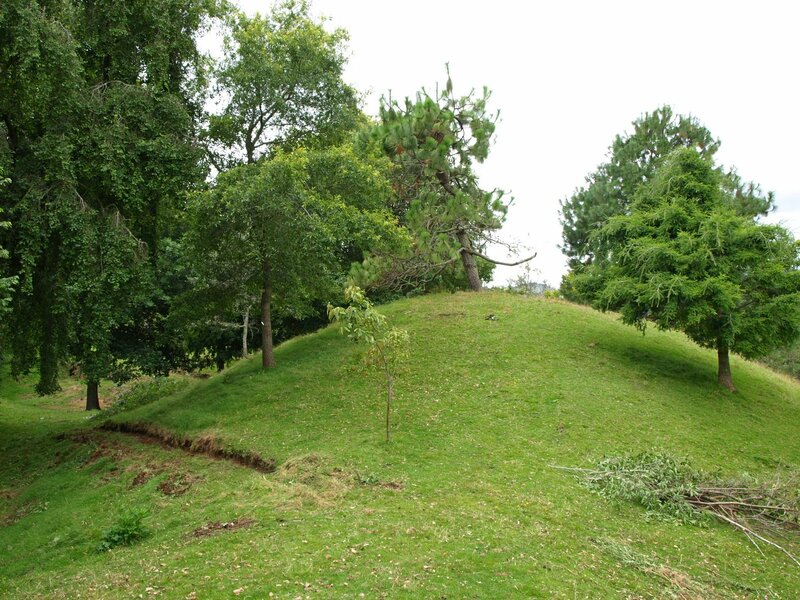 The berries are not ripe yet, and I do not live in the Middle Ages……. We’ll just enjoy the shrub for it’s beauty. 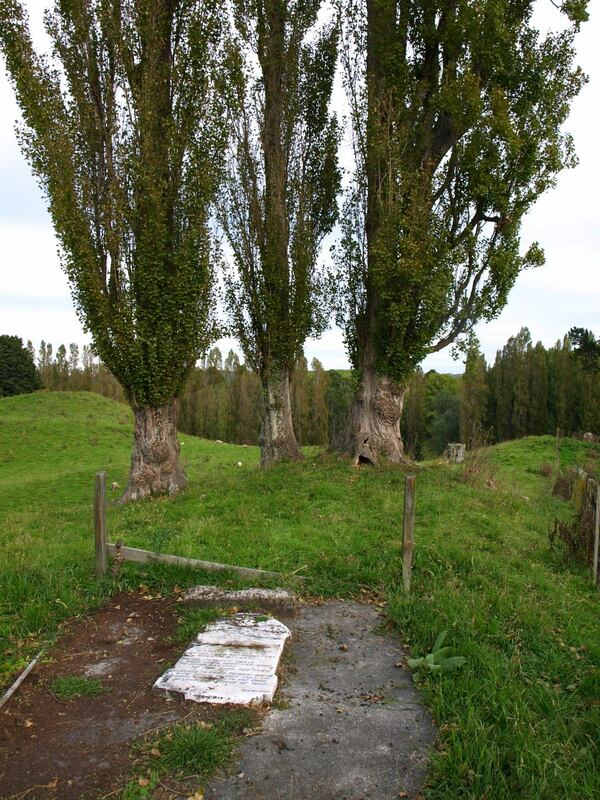 Today John and I made a walk to the grave of David Whyte and some of his family members, in the paddock just past the woolshed. 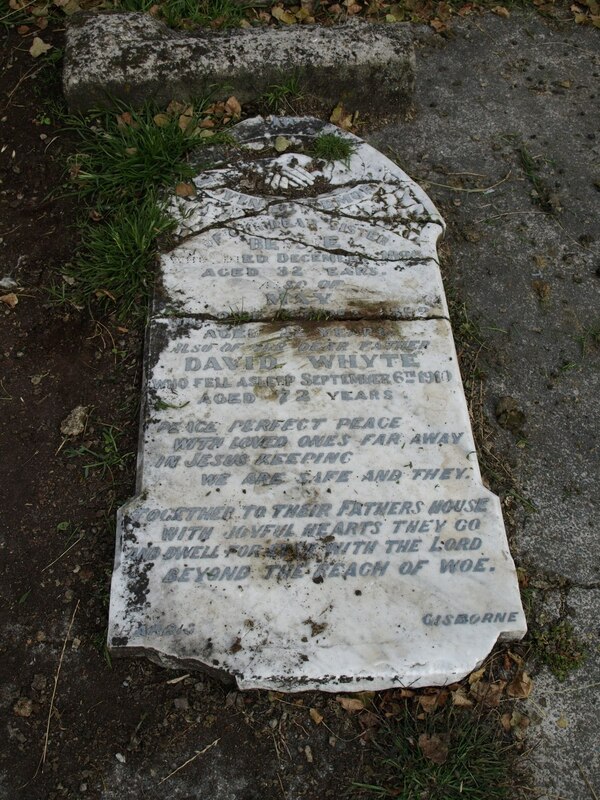 We found the one gravestone. WE ARE SAFE AND THEY. The grave definitely needs some maintenance! 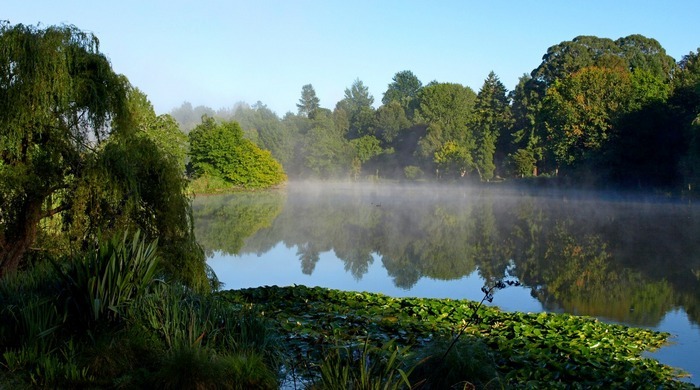 David Whyte was the original owner of Hackfalls, which he then called Abbotsford. 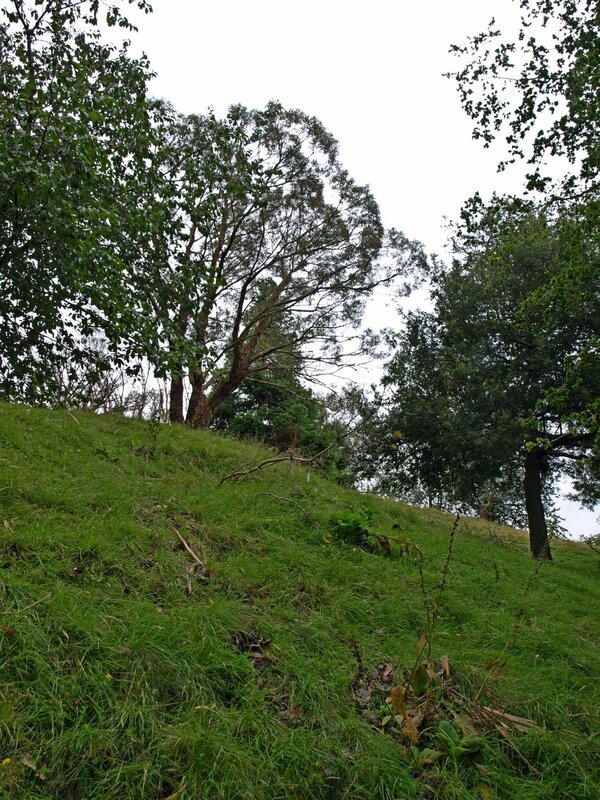 He build a two storey house, according to Colleen Bull (2000) – ”From Papa to Pumice and Back Again” (the history of the Mossmann family of Awapiko and The Laurels at Waerengaokuri). 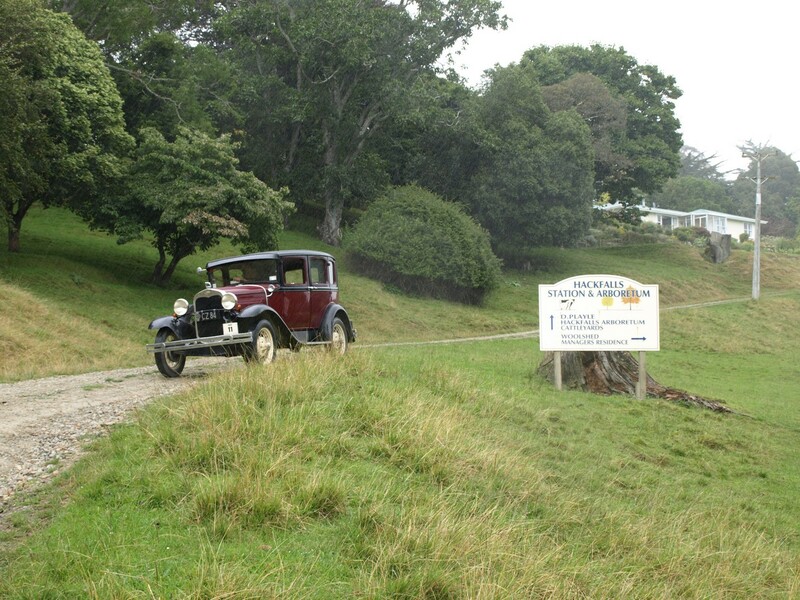 I suppose this was the building that has become known as the original homestead (of Abbotsford / Hackfalls). David Whyte had been trained as an engineer and he had been in charge of railway works in India, before he came to Tiniroto and became a farmer. 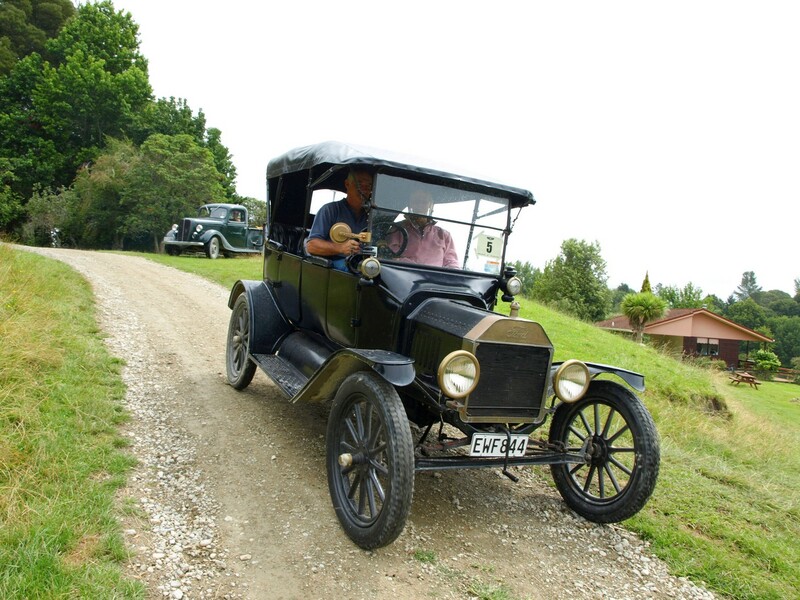 He made a proposal in 1896 to create an inland route between Wairoa and Gisborne via Frasertown, Tiniroto, following the Hangaroa River to Hangaroa township and then to Ngatapa and Gisborne. He estimated the line would cost about £655,000, to be borrowed at 3 % from London. 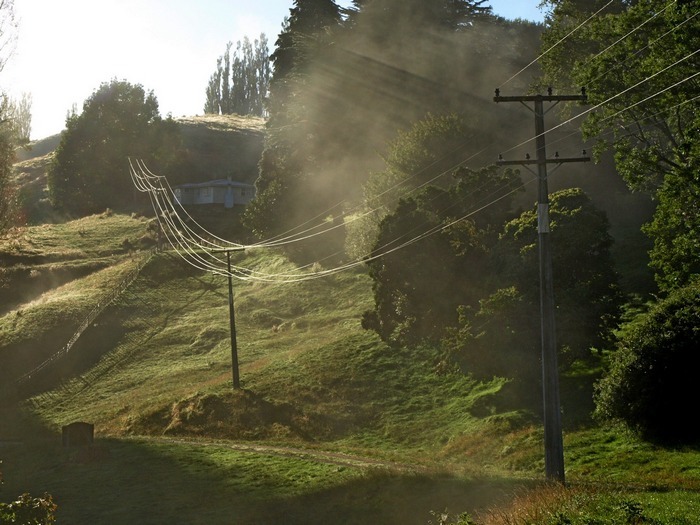 The line was built from from Gisborne to Ngatapa (1914), and from Wairoa to Frasertown (1919), and then abandoned (about 1924). 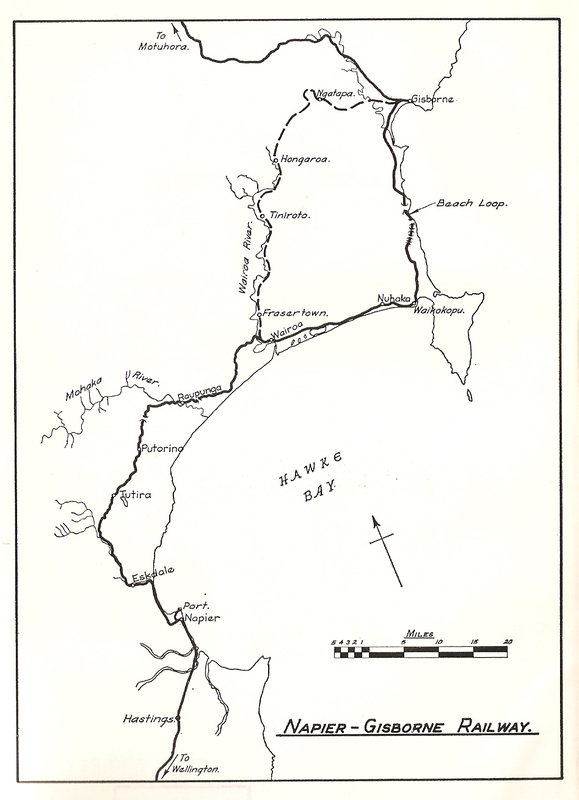 From 1935 onward the so called Wharerata route along the coast was build. This section was finally finished in 1942. Imagine what it would have been like if this plan had become true. 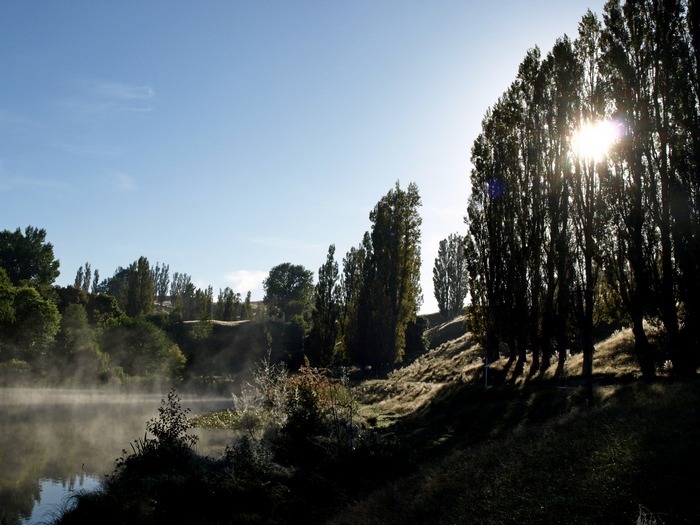 To have a Railway Station somewhere near Tiniroto, perhaps even on the grounds of what now is Hackfalls Station, and take the train to Ngatapa – that’s where Eastwoodhill Arboretum is nowadays! A direct railway connection between Hackfalls and Eastwoodhill! John and I also tried to figure out where exactly the original homestead has been standing. It must have been somewhere in the far corner of the paddock, on a flat place. There are quite a few very old trees over here. 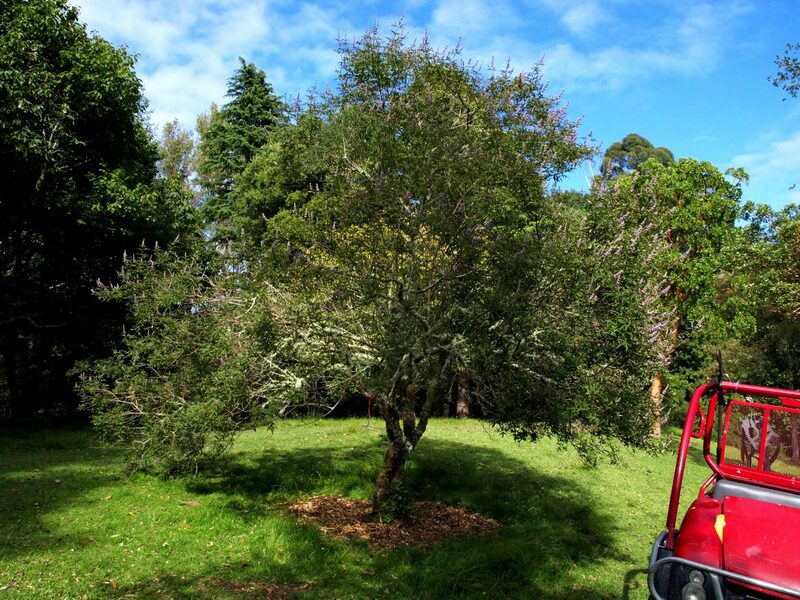 Mainly Pinus radiata and some gum trees Eucalyptus. 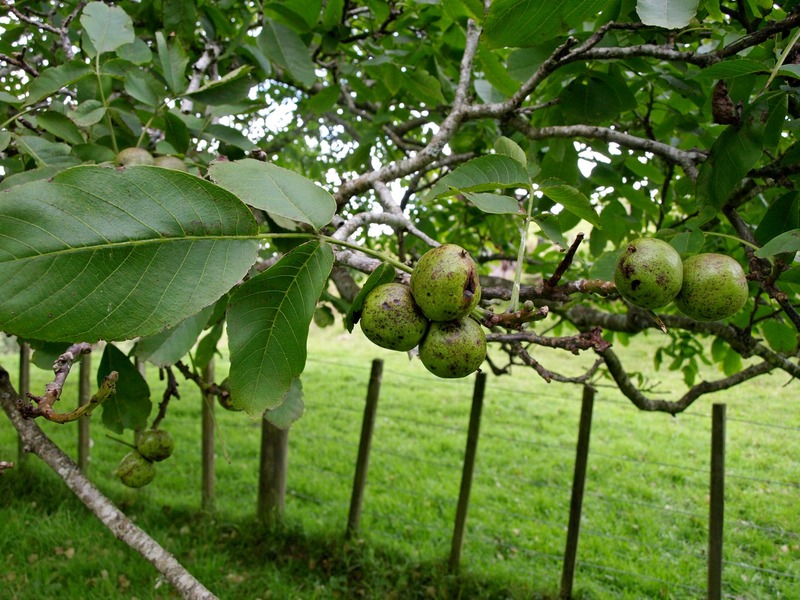 And there is also a walnut tree Juglans regia. We found a fig tree as well. I can’t find these trees in the cat. In this corner we also found some growth of Periwinkle (“maagdenpalm” in Dutch – Vinca). 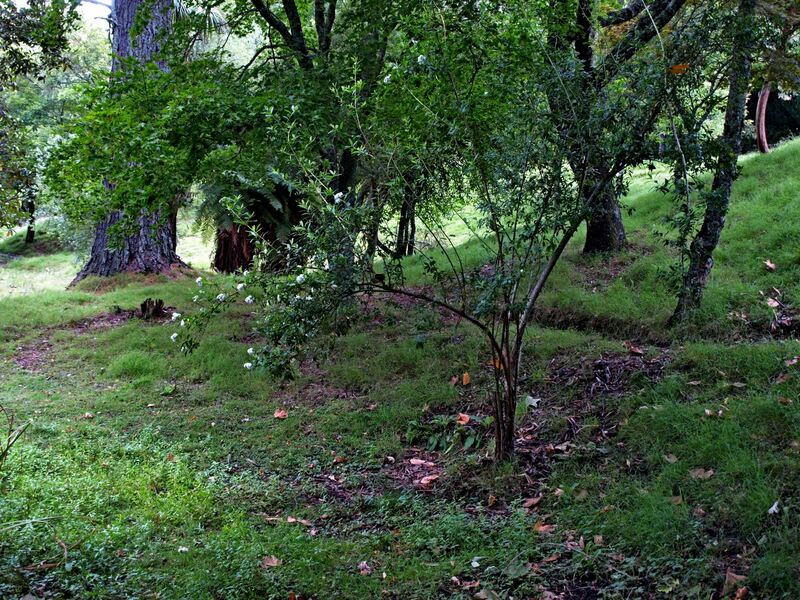 Typical traces of an old settlement. Bellamy, A. C. (1969) – The Napier Gisborne Railway : The story of its construction and development. Napier (? ): NZ Railway and Locomotive Society Inc., Hawke´s Bay branch. 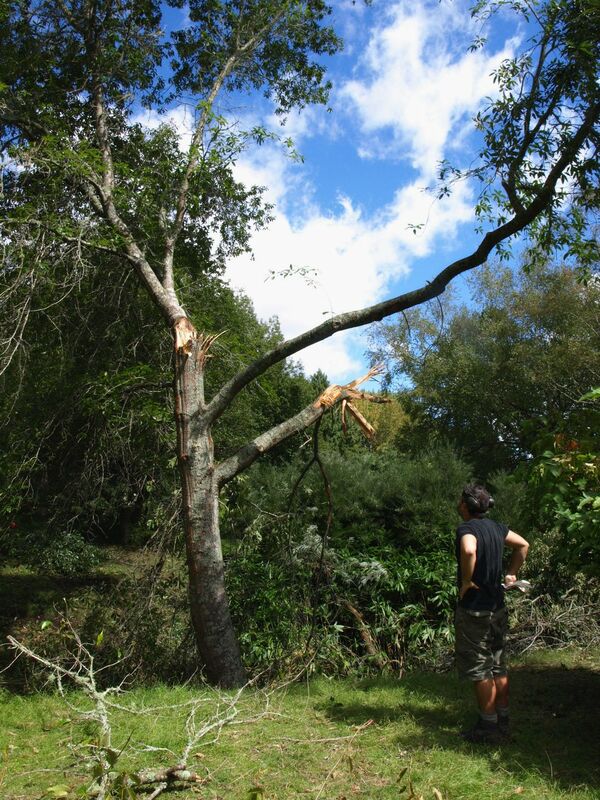 Today we did a lot of work on cleaning the damage that occurred last week to a Quercus laurifolia x incana 1970 027 in the Oak Paddock (close to the patch of bamboo in the gully). In a little storm of last weekend it got terribly damaged. I think we’d best take it down more or less completely, and try to let it regrow from a 4 meter stem or so. Next to it is a very nice Cornus walterii. The leaves are red brown. 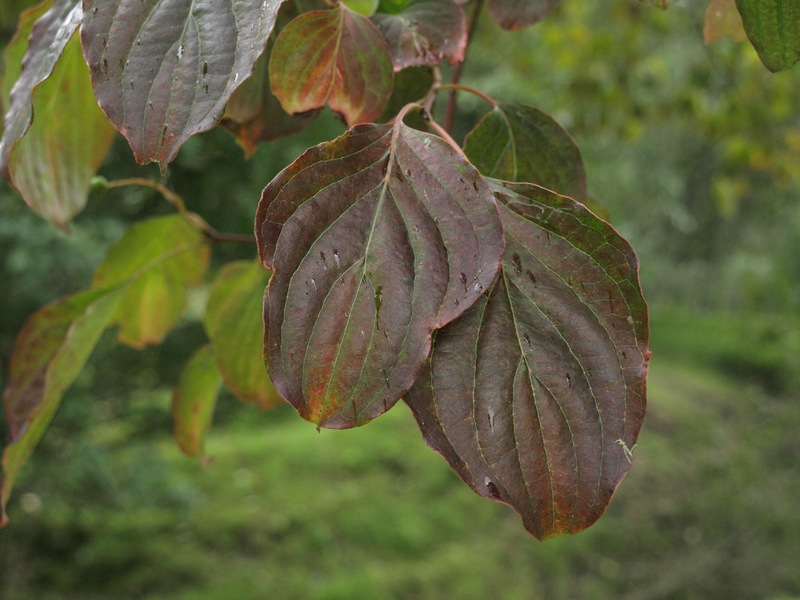 There is another specimen of C. walterii in the Ridge paddock, which does not have these red brown leaves! This week we had some new volunteers at Hackfalls Arboretum. John Buxton (family relation of Diane) and his friend Paul had been joining us yesterday already. And today a new volunteer from England arrived, called James. He has been working in Rosemoor for a couple of months. Perhaps that’s how he heard about Hackfalls Arboretum. 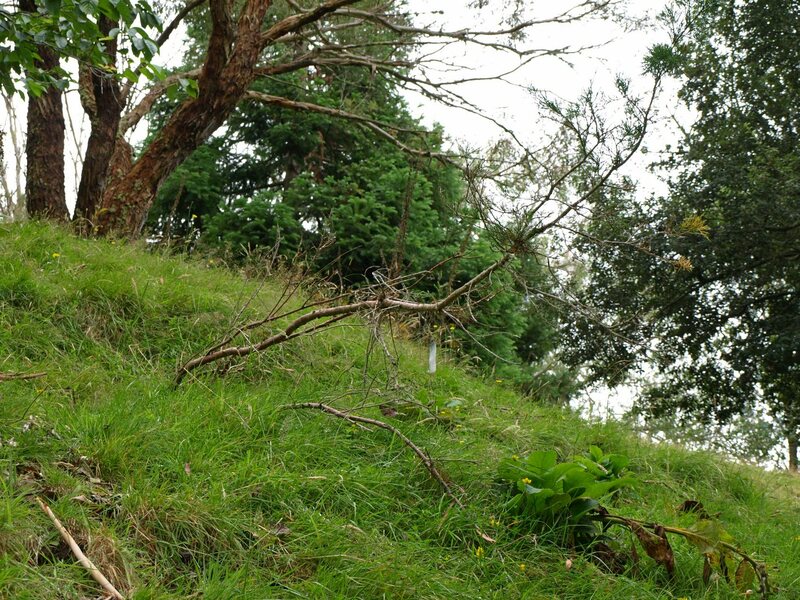 He’s been staying a few times in Aotearoa before, mainly in the Nelson Region. This is his first time on the North Island. 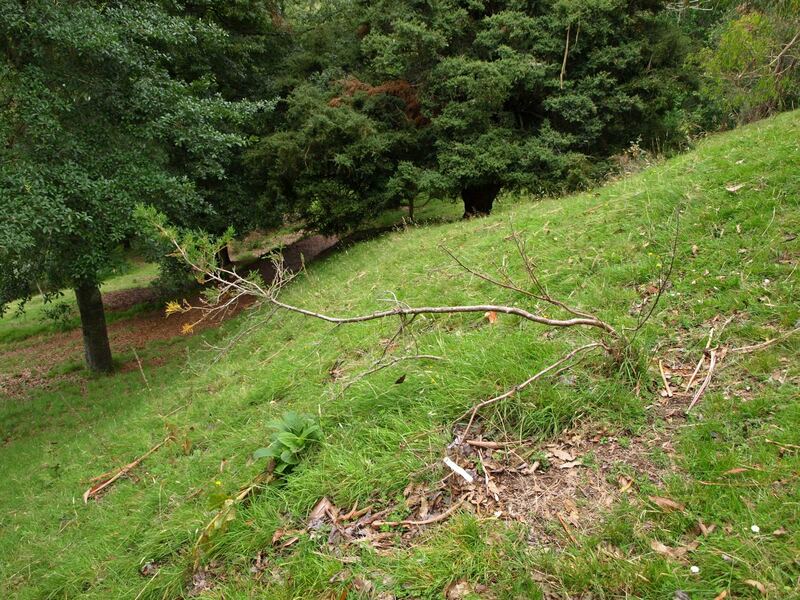 He plans to stay on Hackfalls Arboretum for a month. 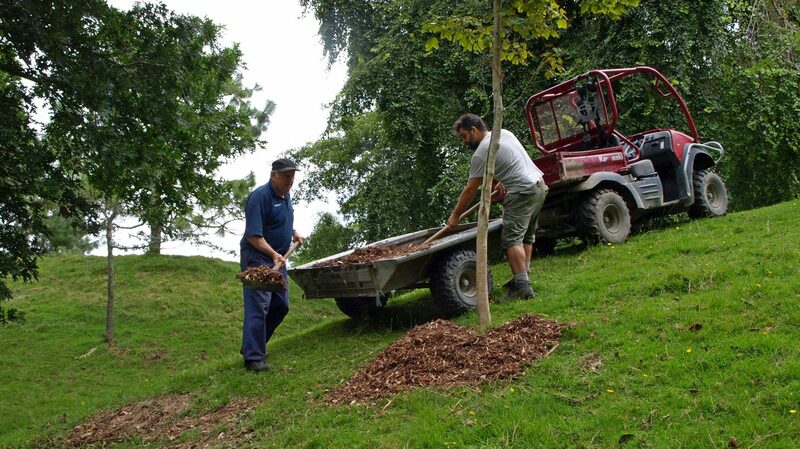 Today we did a lot of work on spreading the chips, so mulching the trees, on the southern bank of the Ridge (like yesterday). 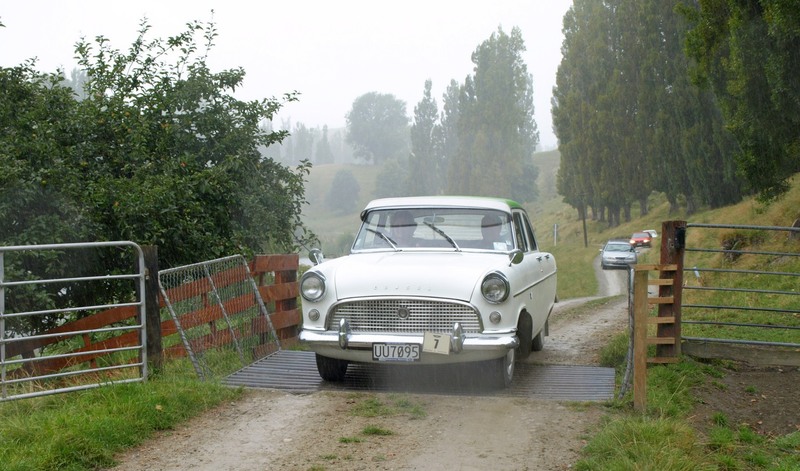 On the picture John and James are unloading a trailer of chips around the …. tree. It was misty when the sun rose this morning and I got out of bed. So I decided to try to make some pictures of that very strange morning light. I walked down the driveway. 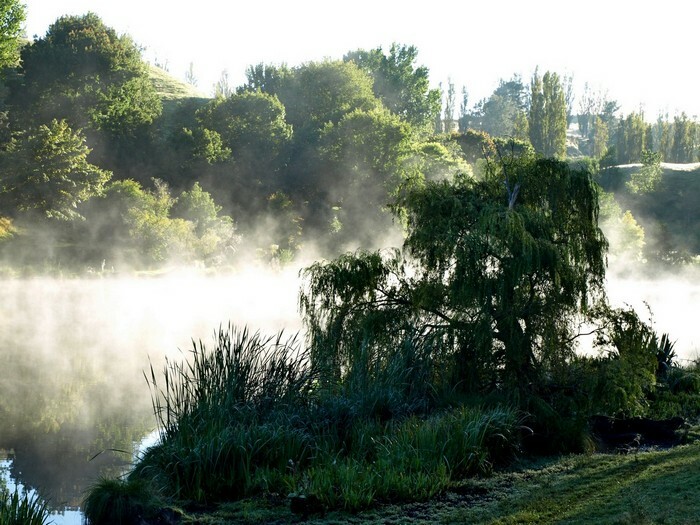 But when I came to Lake Kaikiore, I saw the mist disappearing within minutes…..
And the sun came shining through the poplars. Only minutes later nearly all the mist had gone. The beginning of a sunny day? 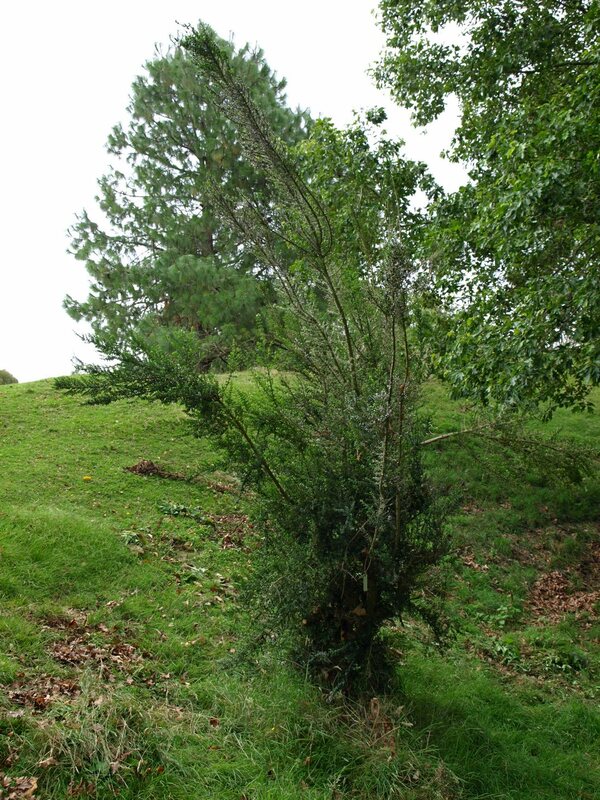 Let’s have a look at the Rhaphithamnus spinosus 1997 059 today….. The shrub was rather badly damaged (by the snow?). I took out most of the dead branches. The shape is still a little bit strange. 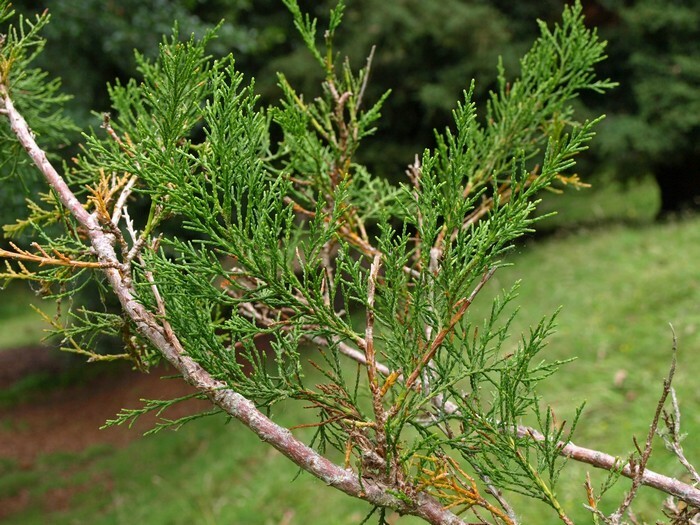 It is a prickly shrub. And I’ll try to grow some cuttings of it. We missed the flowers , but now it has these nice blue berries. And yes, we’re in H7 already! We’re slowly moving on! We have been cleaning large parts of the eastern side of the Ridge paddock now, nearly down to Lake Karangate on some places, and at least down to the southern (red) track. 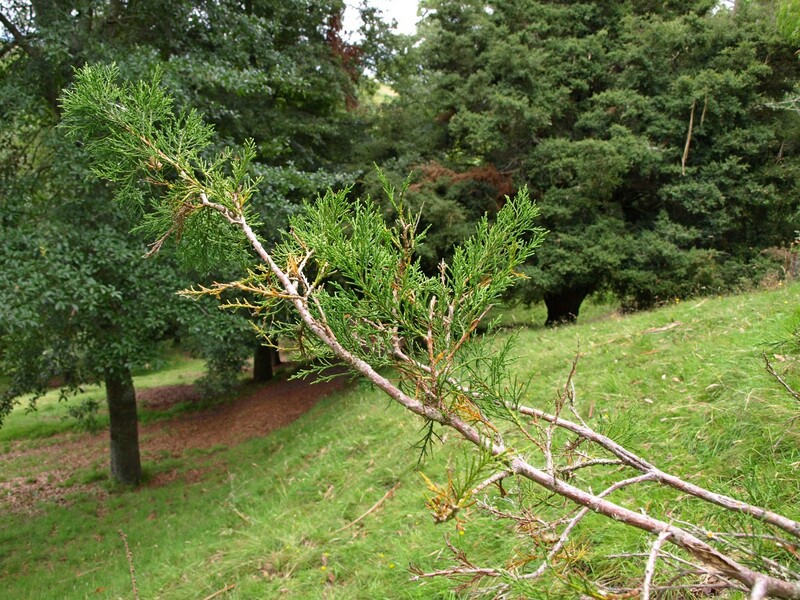 We did much of the hill with Pinus devoniana and P. montezumae, the Mexican pines. 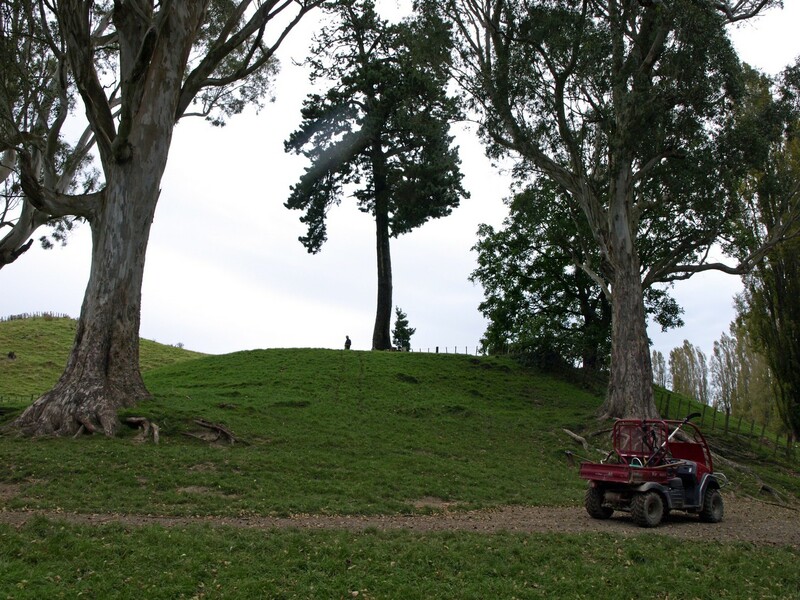 Even cleared a bit of the little track that goes along the hill…… Kees has been mowing for hours again. And I tried to collect dead branches, and removed many dead and low branches of the trees. It’s all looking quite nice and tidy again, this area. It looks like it is taken out of the protection. Another victim of the unprofessional protection removal of last year….. It is a very small plant, and it urgently needs a new protection (and a place in the cat!). 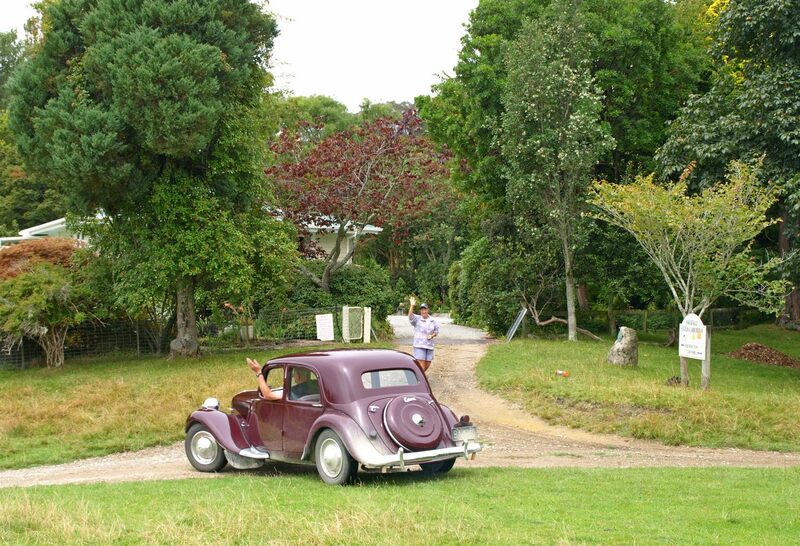 This afternoon a group of Vintage Car drivers – from Gisborne, as far as I could understand – came to Hackfalls Arboretum. When they arrived it was raining a bit, but the weather got much nicer when we walked through the arboretum. 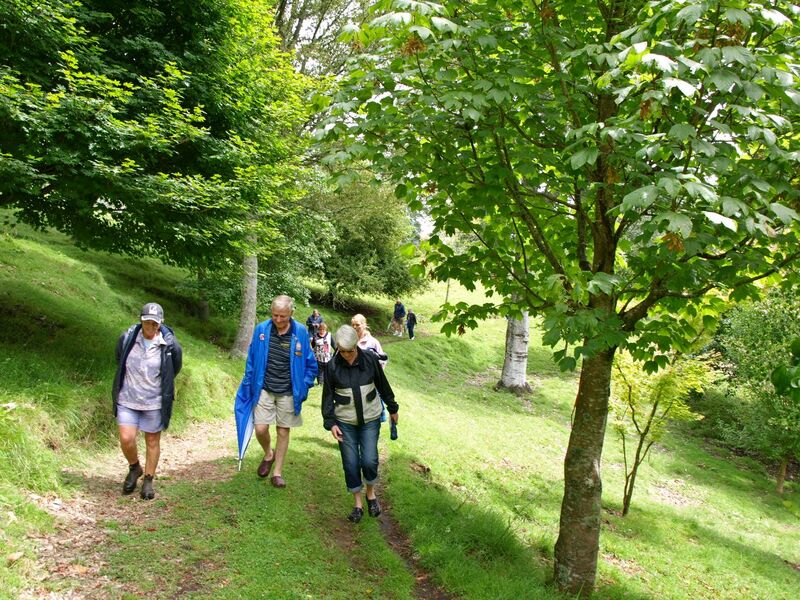 Although some of the younger folks didn’t like walking, there was a nice group that took the opportunity to have a look at the trees. 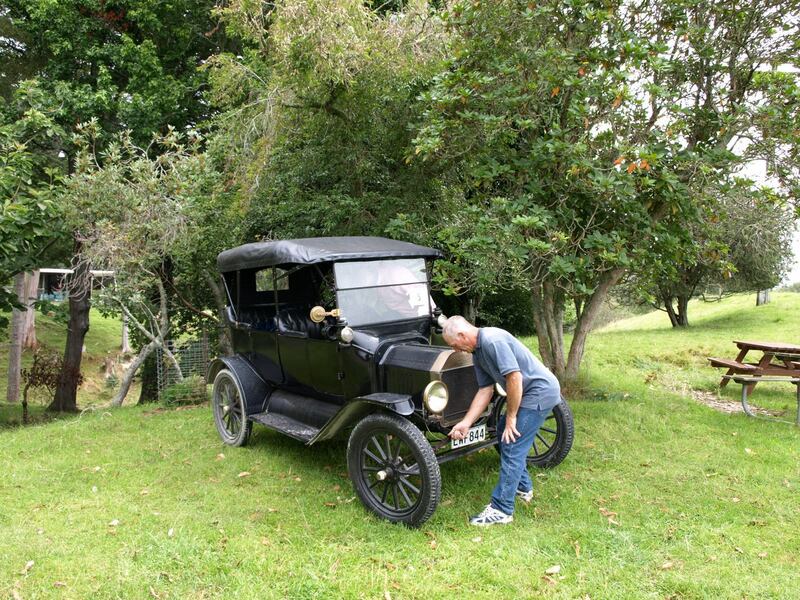 When leaving, the old Ford had to be started manually…. And away went the last one, again.